Anger Is a Gift was a truly impactful and timely read. First of all the title of the book is fantastic. Often times POC, especially blacks, are stereotyped as angry (ie: the angry black woman) by outside communities. Within their own communities, POC, especially blacks, are told to hide their anger because it can put them in danger. The idea of harnessing anger and using it to create good, and seeing a black boy do that was incredible. In terms of characters, I absolutely adored Moss. No ifs ands or buts about it. I thought his character was well-developed and that though a lot of stuff happened to him, he both gained and maintained agency as the novel progressed. I usually prefer first-person narration, but I thoroughly enjoyed the third person narration of this story. By the end of the novel, I felt like I had truly connected with Moss. Oshiro’s writing was both atmospheric and haunting. I felt IN the story and didn’t leave until the last sentence (which I loved!). Anger Is a Gift is the first book that I’ve read in a while in which I’ve felt so deeply emotionally invested. I teared up multiple times throughout the novel. I loved the romance in this novel, even though it broke me. The rep was also so encompassing within this novel. Moss’ friend group is very diverse, and while I can’t speak personally to all of the rep, it’s super important to note. Moss is gay, one of his friends is a lesbian, one’s bisexual, and one’s ace. There’s also, Bits, who’s nonbinary. Moss also has anxiety, and while I can’t speak personally as to the quality of the rep as I don’t have anxiety, I did want to mention it because it’s a key part of who Moss is. So if you’re a reader looking for rep in any of the above categories, definitely check out Anger Is a Gift. I loved the friend group as whole, and the ensemble-esque feel that Anger Is a Gift had. I would easily read a novel about any of the friends in order to get to know them better. The depth and power of the relationships within this novel were also amazing, especially the relationship between Moss and his mom. I really liked the focus on police brutality and teen-led activism. And to see a YA novel with a gay black boy who has anxiety as the MC was also pretty great. 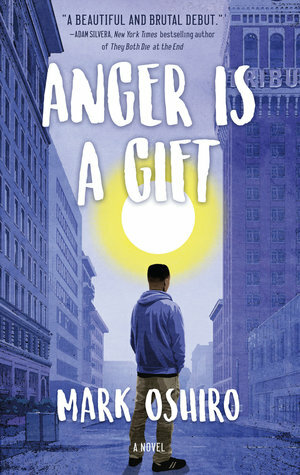 Overall, Anger Is a Gift is a book that breaks you and doesn’t necessarily put you back together with a nice tidy bow. It makes you think and it makes you feel. And it makes you want to take action against inaction, just as Moss does. Great takes on this one. I really enjoyed Anger is a Gift.